Russia's President Vladimir Putin has described the collapse of the Soviet Union as "the greatest geopolitical catastrophe" of the 20th century. Mr Putin's annual state of the nation address to parliament was broadcast live on Russian television. He said the break-up of the USSR in 1991 was "a real drama" which left tens of millions of Russians outside the Russian Federation. He also said Russia must develop as a "free and democratic" country. But he stressed that Russia "will decide for itself the pace, terms and conditions of moving towards democracy". "We are a free nation and our place in the modern world will be defined only by how successful and strong we are". Critics accuse President Putin of concentrating too much power in the Kremlin, pointing to controversial changes in the way provincial governors and parliamentary deputies are elected. Mr Putin also said Russians who had saved money overseas should be encouraged to return capital to Russia. He called for a flat 13% tax on all undeclared revenue. "Tax authorities have no rights to terrorise business," Mr Putin said. Massive demands for back taxes crippled Russia's largest oil firm Yukos - and its plight has alarmed many western investors. 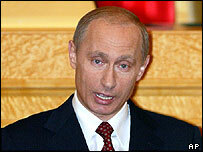 Monday's speech was Mr Putin's second state of the nation address since he was re-elected by a landslide in 2004. His wide-ranging speech also touched on the government's efforts to combat terrorism. He called for "radically new approaches" to tackle the threat, which he described as "still very strong". "The moment we display weakness or spinelessness, our losses will be immeasurably greater," he warned. He said "unlawful methods of struggle" would not be allowed in Russia. The BBC's Damian Grammaticas in Moscow says he may have been alluding to the recent turmoil in Ukraine and Kyrgyzstan. He also promised a fairer media and less corrupt government. Last week US Secretary of State Condoleezza Rice expressed concern at the progress of democracy and media curbs in Russia.